Eight Automated External Defibrillators (AED), designed to bring the heart back into rhythm should a person be in a life-threatening circumstance, are located on the American River College campus. “We are trying to ensure everyone in the division is aware of their location and purpose,” said Dean of Fine and Applied Arts Charles Braden when queried about the AED in his office. “We don’t want people like Bonnie Jean (a front office worker of Fine and Applied Arts) asking ‘what’s that?’ when we have an emergency,” said Braden. Braden said that the school was proactive about campus safety, as Action Coordinators for Emergency Survival (ACES), an outside educational venture in conjunction with the Los Rios Police Department, offered training to faculty, staff, and management on Feb. 9. The training, however, was about school evacuations in an emergency and did not include use of AEDs. Joanne English, a professor in the Kinesiology and Athletics Department, said she is aware of all of the AEDs located on the ARC campus and thinks there should be more. “There should be at least two AEDs in our area, and (faculty) don’t have the keys to to get into the Athletic Training Office if it were closed in the case of an emergency,” English said. English added that there are additional difficulties to making changes to the current situation. “I think it would be a good idea that faculty, staff and students were trained in the use of CPR/AEDs and first aid, but in the case of faculty, because of their contracts, we can’t ask them to do anything,” English said. “We do have eight to 12 athletic student trainers at any given time, all of our pool lifeguards are required to be current in their Red Cross certification for CPR/AED and First Aid,” English said. Tahnee Beal, a student volunteer from California State University, Sacramento that works in a training office where one of the AEDs is located, said that the five student volunteers from Sac State and six other volunteers were all required to be currently certified in CPR/AEDs and First Aid to participate in the program. 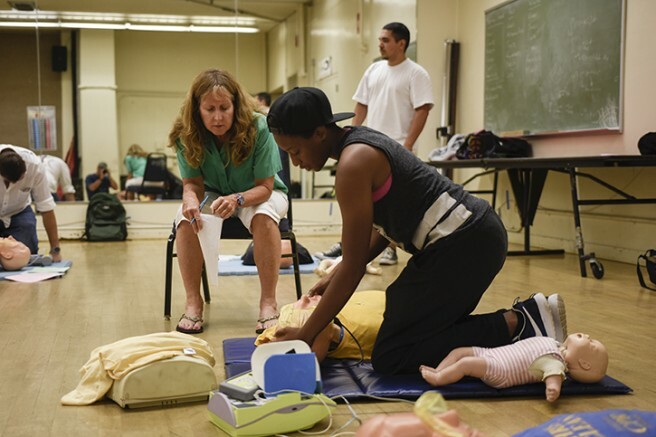 English will teach a CPR/AED class this spring titled HEED 310 – Community CPR and Adult AED, along with the more advanced HEED 323 – Cardiopulmonary Resuscitation CPR/AED for the professional rescuer. HEED 310 will meet on every Friday from Feb. 26 to Mar. 18 from 9 a.m. to 1:15 p.m. HEED 323 will meet on April 1 and April 8 from 9 a.m. to 1:15 p.m. The eight AEDs at ARC are serviced and maintained by the LRPD, and are located in the library, the cafeteria, the third floor of Davies Hall, the fine art administrative office, the technology instruction building, the main gym, the nurse’s office in the administration building and the police department. Tracy Mapes is a first-semester student on the Current, where he serves as a staff member. He has been a news photographer working and freelance news stringer in the Sacramento valley from 1995 to 2005. Be the first to comment on "ARC to offer training for AEDs on campus"